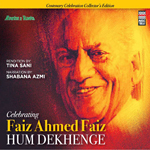 This Ghazal album is a Centenary Celebration Selectors Collection to celebrate the 100th year of the birth of Faiz Ahmed Faiz throughout the World. The objective of this celebration is to present Faiz as the ambassador of the soul and feelings of the people of Pakistan by projecting his poetry and other literary works as well as his struggle for peace in the world and prosperity of the people. The Ghazals have been sung by Tina Sani. RABTA means the connection. This album celebrates the cherished musical connection between India & Pakistan. It showcases the soulful bond between the singers, the common poetic and musical tradition of the two countries, carried forward by the artistes from either sides of the border. This album brings out the priceless collection of the most celebrated ghazal pioneers from India and Pakistan such as Mehdi Hasan , Jagjit Singh, Iqbal Bano, Chhaya Ganguli, Farida Khanum, Ghulam Ali, Radhika Chopra and Sudeep Banerjee.